The complexity and richness of Jupiter's "southern lights" (also known as auroras) are on display in this animation of false-color maps from NASA's Juno spacecraft. Auroras result when energetic electrons from the magnetosphere crash into the molecular hydrogen in the Jovian upper atmosphere. The data for this animation were obtained by Juno's Ultraviolet Spectrograph. The images are centered on the south pole and extend to latitudes of 50 degrees south. Each frame of the animation includes data from 30 consecutive Juno spins (about 15 minutes), just after the spacecraft's fifth close approach to Jupiter on February 2, 2017. The eight frames of the animation cover the period from 13:40 to 15:40 UTC at Juno. During that time, the spacecraft was receding from 35,000 miles to 153,900 miles (56,300 kilometers to 247,600 kilometers) above the aurora; this large change in distance accounts for the increasing fuzziness of the features. Jupiter's prime meridian is toward the bottom, and longitudes increase counterclockwise from there. The sun was located near the bottom at the start of the animation, but was off to the right by the end of the two-hour period. 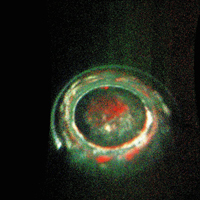 The red coloring of some of the features indicates that those emissions came from deeper in Jupiter's atmosphere; green and white indicate emissions from higher up in the atmosphere.